Track&Field is not a mainstream sport, it is watched by non-experts only because of the presence of athletes as Usain Bolt but what will happen when they will stop running? This is the main topic of the BBC interview to the World Federation President, Sebastian Coe. Steve Cram is the interviewer, 1.500m World Champion and lifelong Sebastian Coe’s rival, now sport commentor for BBC. Coe recognizes one of the main problems for Track&Field is that it is not running during the whole year but only between September and May; this leads to a “hole” in the news for some months thus the people focus more on sports with a higher season coverage. It is necessary to find countries where competitions can take place so that to focus on that, increasing the head-to-head between the most powerful athletes who, right now, only challenge during the world competitions to award prizes. Besides extending the season, the IAAF President would implement some drastic changes throughout the term of his office. What will cause a relevant sensation, is the idea to decrease the duration of World Championships “What is going on currently is completely different respect to we were competing? 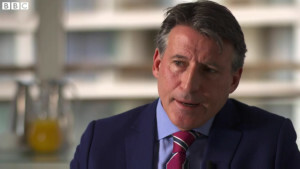 – Sebastian Coe wonders – Yes, it is in some way. People in 1983 were ready to watch 10 days of World Championships, now they are not. We must be realistic. Will we have a Championship? No, we will not, not now. Will we have it in five years? We must have it“. The second topic is about social media; in a digital era as the one we are living in, Track&Field is still too less present on the social compared to sport as football or tennis which have digital platform able to spread information towards a wide number of people. There were, of course, questions about doping too, after the scandalous caused by the revelation about Lamine Diack that put the World Federation in the firing line. “I think IAAF was more active than defensive. If you don’t go fishing you cannot catch the fish and there have been a lot of sports with this kind of attitude”. He stated that despite the scandal, important steps forward have been done in the antidoping sector in the last years with the creation of the biological passport and the spot-check out of the competitions and, even though the price to pay was high, it has been showed the system is quite strong. What it has to be done right now is to attract the athletes and show them they can have faith in this sport; after the discoveries about the ex president corruption many got their distances from a world which was thought to be safe. It is not time to bring them back.